Quality Metal work..from design to installation. We offer a professional tailored service providing high quality workmanship at affordable prices! Custom made Manual and Automatic gates. 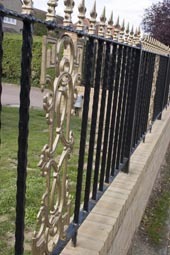 Ornamental/Bespoke Design Railings and Balustrades. Internal and External staircases including fire escapes, spiral, steel. All types of metal work custom made to individual design, size and form including commissioned art and artistic collaborations. All our work is manufactured from raw materials in our workshop. If required we can assemble on site by fully trained, professional staff. We offer a free advice service and free quotations, so contact us now!